Here you see pictures of my vampires. 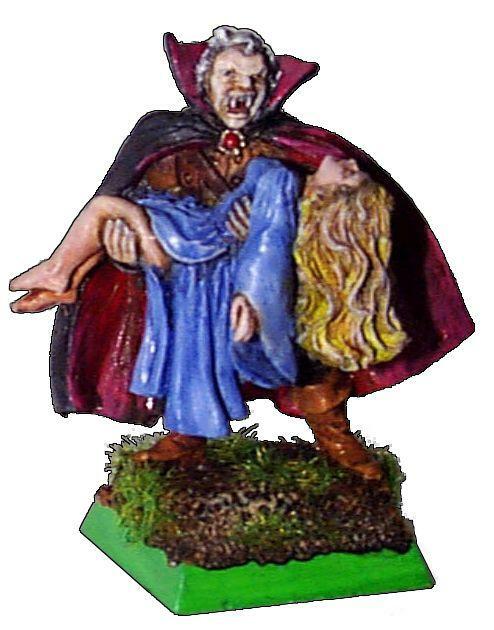 The vampires are painted in bright colors to stand out. The vampiress (Lhamina is my favorite) is painted in red and orange, the master vampire in a darker shade of red. This is my vampire lord. He is always hungry and takes a little snack in the battle. The model is from Reaper Miniatures out of the Dungeon Dweller Collection. It's number 2136, Rafael Maladoni. I didn't do any fancy things with the cloak or so. The whole model is just carefully shaded and hightlighted. This is my vampiress. As I wrote above she is painted in red. Sadly the photo doesn't look quite as good as the real model. This is my second vampiress. 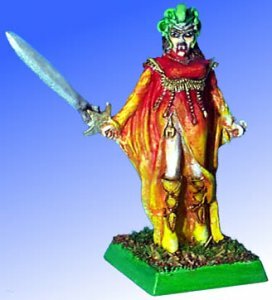 The model is a converted mortheim sister of Sigmar (Sister Berta in fact). First I removed a lot of armour including spikes and armor plates. Then I swapped the amulet with a small skull from the mortheim double handed sword. At last I swapped one of the hammers against the sword. The whole is painted with red and yellow. This is one of my new witches. I play them as necromants on nightmares. The model is from Excalibur and is called "Valpurgis". It is very good, looks terrific and has exactly the right size for Warhammer.